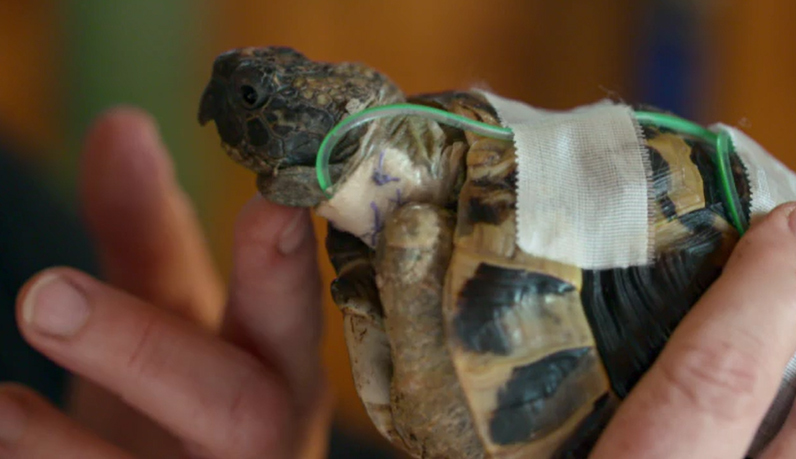 This week The Supervet faces one of his greatest practical and ethical challenges yet, when he’s introduced to Hermes, a 5 year-old Hermann tortoise with only one good leg. Sadly, Hermes was attacked whilst in his garden and lost three of his feet. Devoted tortoise lover Helen adopted Hermes two years ago from another family. 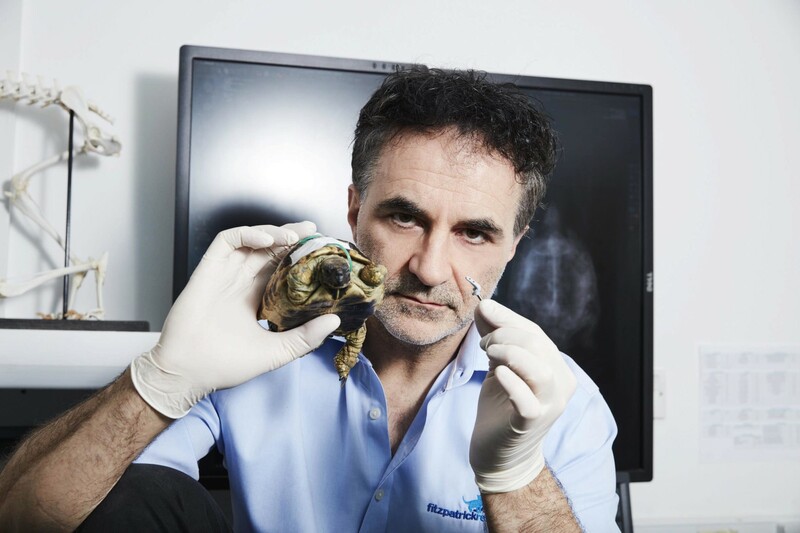 As this breed of tortoise can live for up to 80 years, Hermes should have his whole life ahead of him, so Helen decides to bring him to Professor Noel Fitzpatrick to see if he can offer him the hope of being mobile once again by giving him prosthetic feet, something that has never be done for a tortoise before. Following an honest conversation with Helen, Noel asks: It’s a very difficult moral dilemma isn’t it? Cause it’s easy to put him to sleep.. It’s just about whether it’s morally right. I know you love him and I know it will be heart breaking for you to say goodbye but we’ve got to do the right thing don’t we? Helen asks Noel to try and give Hermes a shot, and create tiny titanium implants which would be attached to the remaining bone in Hermes’ three legs. Once the implants have bonded to the bone Noel plans to attach specially-designed flipper like feet in the hope that one day Hermes will walk again. But as he goes into surgery Noel is apprehensive “I’d say it’s 50:50 at best. I very rarely go into surgery with 50:50 odds, but I think it will weigh heavily on our consciences if we don’t try” He says. Gutsy Hermann Hermes is close to his mum Helen’s heart. She adopted him 2 years ago and he lives with Helen’s other Tortoise, Tomasina. 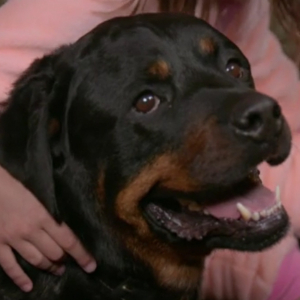 Hermes suffered traumatic injuries to his legs when he was attacked by rats in the garden. His two front legs have already been amputated to the elbow and his right back leg has been partially amputated but is severely infected. His mobility has been completely affected so he needs the help of a tube to feed. Helen wants Hermes to have the chance to walk again and live a full happy life and hopes that Noel can offer all the options available. Noel was very concerned about the extent of Hermes’ injuries and the prospect of limb amputation prosthesis. 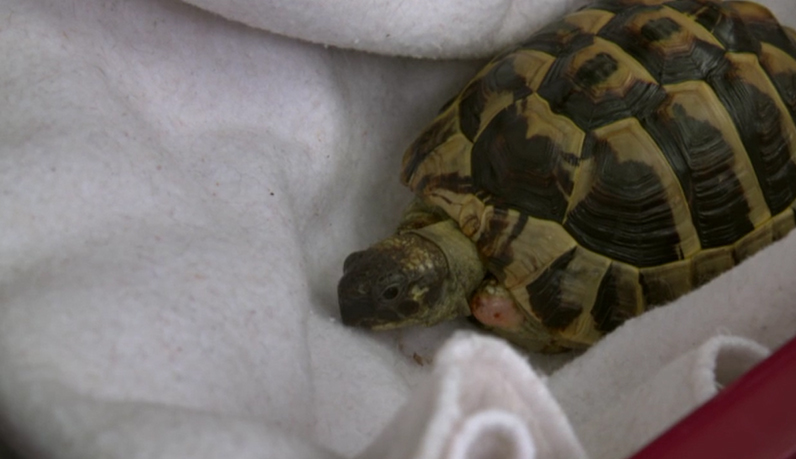 While his PerFiTs technology has been given to a number of dogs and cats, the operation had never been undertaken in a tortoise and Hermes’ would be a world first. Realistically there were only two options – he operates to try and give Hermes three new feet or Hermes is put to sleep. Helen was determined to do all she could to give Hermes every chance and asked Noel to go ahead with the surgery, knowing that he had very few alternative options. Noel felt that it would weigh heavily on their consciences if they didn’t try. He explained to Helen that the chances were around 50/50 that the procedure would be a success, but together they made a leap of faith, motivated by the will to help Hermes. Noel and the team initially conducted a CT scan to identify what was left of Hermes’ limbs and immediately removed the infected remaining tibia bone in his right hind leg. Before the operation could go ahead, Hermes needed to recover from the infection and went home with Helen to recover. Tortoises have very slow metabolisms and therefore their recovery time is longer, but finally Hermes returned to Fitzpatrick Referrals to undergo the surgery to give him three new feet, and hopefully, a new lease of life. They were joined by exotic animal expert, Neil Forbes to ensure Hermes had all necessary and unique support required. Hermes returned home to recover under the watchful care of his loving mum Helen. His legs were healing very well, but Helen began to notice that Hermes wasn’t his energetic self. She immediately consulted a local exotic vet, knowing in her heart that she may not see him again. Helen received the heart-breaking news the following morning that Hermes had passed away from internal organ failure during the night. Noel and the team at Fitzpatrick Referrals were devastated to hear the news of Hermes passing. Helen and her husband Robert laid Hermes to rest in his favourite spot in the garden and will always remember how much of a fighter he was. His journey is an example of the determination and unconditional love held by the families who seek to better the lives of their animals they hold dearly. When faced with questions of ethics, it is at both the hearts of the vets and the families to determine the best quality of life for their loved ones. Hermes presented a significant ethical dilemma. He was a young Tortoise with a lot of fight who may live a very long time – but his quality of life was poor – and even though the surgery would be challenging and the prognosis uncertain, we knew it would weigh heavily on our consciences if we didn’t try. We would do this for humans, dogs and cats… and as a vet, I signed up to help all animals where possible and if we feel morally it’s the right thing to do – why deny him the chance and why deny his loving family the chance to help him? All life matters.